Asia_Bibi_blasphemy_case - TerritorioScuola Enhanced Wiki Alfa - Enhanced Search with WikiPedia Using Robots to display related resources from the web to all WikiPedia words (Video/Audio, .doc, ,pdf, .ppt, maps, edu, .html). "Asia Bibi" redirects here. For the Kazakh mausoleum, see Aisha Bibi. Judgement of Courts below reversed. The Asia Bibi blasphemy case involves Pakistani Christian woman Aasiya Noreen (Urdu: آسیہ نورین‎ – Āsiyaah Naurīn [ˈɑːsiɑː nɔːˈriːn], born c. 1971; commonly known as آسیہ بی بی Āsia Bibī), who was convicted of blasphemy by a Pakistani court and was sentenced to death by hanging in 2010. In October 2018, the Supreme Court of Pakistan acquitted her based on insufficient evidence, though she was not allowed to leave Pakistan until the verdict was reviewed on 29 January 2019. In June 2009, Noreen was accused of blasphemy after an argument with co-workers while harvesting berries. She was subsequently arrested and imprisoned. In November 2010, a Sheikhupura judge sentenced her to death by hanging. The verdict was upheld by Lahore High Court and received worldwide attention. Various petitions for her release were created by organisations aiding persecuted Christians such as Voice of the Martyrs, including one that received 400,000 signatures, and Pope Benedict XVI and Pope Francis called for the charges to be dismissed. She received less sympathy from her neighbors and Islamic religious leaders in the country, some of whom adamantly called for her to be executed. Minorities minister Shahbaz Bhatti and Punjab Governor Salmaan Taseer were both assassinated for advocating on her behalf and opposing the blasphemy laws. Noreen's family went into hiding after receiving death threats, some of which threatened to kill Noreen if released from prison. Muslim cleric Maulana Yousaf Qureshi announced a bounty of 500,000 Pakistani rupees to anyone who would kill her. On 31 October 2018, the Supreme Court of Pakistan acquitted Noreen citing "material contradictions and inconsistent statements of the witnesses" which "cast a shadow of doubt on the prosecution's version of facts." The decision sparked protests headed by Islamist parties in major cities of the country, but was praised by human rights groups and those advocating on behalf of Christian minorities, such as International Christian Concern, Open Doors, and Aid to the Church in Need. On 2 November 2018 however, the Government of Pakistan signed an agreement with the Tehreek-e-Labbaik political party (TLP), which was leading the protests; this agreement barred Asia Bibi from leaving the country. This agreement between the Government of Pakistan and Tehreek-e-Labbaik has led to "allegations [that] the government was capitulating to extremists". The governments of Italy, Canada, and other Western countries, are currently working to help Asia Bibi leave Pakistan. On 7 November 2018, Asia Bibi was released from the New Jail for Women in Multan. However, by Christmas, Asia Bibi was reported to have spent Christmas Day in some sort of custody. On 29 January 2019, a petition requesting an appeal against the court's decision to acquit Asia Bibi was rejected, "lifting the last legal hurdle in the case and paving the way for her to leave the country." On 11 April 2019, Pakistani Prime Minister Imran Khan stated that a "complication" has delayed the departure of Asia Bibi from the country. The blasphemy law in Pakistan has resulted in the extrajudicial killings, incited by accusations, of over 60 people, has been blamed for dozens of communal attacks that have taken place against religious minorities on the pretext of blasphemy, and has been used by individuals as a tool for revenge against other people. Noreen was the first woman in Pakistan to be sentenced to death for blasphemy, and would have been the first person in Pakistan to be executed for blasphemy under the current law. Aasiya Noreen was born and raised in Ittan Wali, a small, rural village in the Sheikhupura District of Punjab, Pakistan, thirty miles outside of Lahore. Poor Christians in the district, and elsewhere in Pakistan, often have lower-class occupations such as cleaning and sweeping. Noreen, who is a Roman Catholic, worked as a farmhand in Sheikhupura to support her family. She married Ashiq Masih, a brick laborer who had three children from a previous marriage, and had two children with him. Noreen and her family were the only Christians in the village. Before her incarceration, she had been repeatedly urged by her fellow workers to convert to Islam. In June 2009, Noreen was harvesting falsa berries with a group of other women farmhands in a field in Sheikhupura. She was asked at one point to fetch water from a nearby well; she complied but stopped to take a drink with an old metal cup she had found lying next to the well. A neighbor of Noreen, Musarat, who had been involved in a running feud with Noreen's family about some property damage, saw her and angrily told her that it was forbidden for a Christian to drink water from the same utensil from which Muslims drink, and that some of the other workers considered her to be unclean because she was a Christian, referring to the caste system in Pakistan. Noreen recounts that when they made derogatory statements about Christianity and demanded that she convert to Islam, she responded, "I believe in my religion and in Jesus Christ, who died on the cross for the sins of mankind. What did your Prophet Mohammed ever do to save mankind? And why should it be me that converts instead of you?" An argument ensued. A mob came to her house, beating her and members of her family before she was taken away by the police. The police initiated an investigation about her remarks, resulting in her arrest under Section 295 C of the Pakistan Penal Code. Five days after the incident, a local Muslim leader, Qari Salem, jumped into the matter and pressured some people in the area to claim that she committed blasphemy. When finding no way to get Ms. Bibi to confess, Salem used the loudspeakers of the mosque, as other Muslim leaders usually do in the cases of alleged blasphemy acts, to spread the news of blasphemy and instigate the people of the locality to punish the alleged blasphemer. The people of the locality beat her severely in the presence of her children. She was subsequently imprisoned for over a year before being formally charged. Noreen denied that she had committed blasphemy and said that she had been accused by her neighbor to "settle an old score". In November 2010, Muhammed Naveed Iqbal, a judge at the court of Sheikhupura, Punjab, sentenced her to death by hanging. Additionally, a fine of the equivalent of $1,100[clarification needed] was imposed. I cried alone, putting my head in my hands. I can no longer bear the sight of people full of hatred, applauding the killing of a poor farm worker. I no longer see them, but I still hear them, the crowd who gave the judge a standing ovation, saying: "Kill her, kill her! Allahu Akbar!" The court house is invaded by a euphoric horde who break down the doors, chanting: "Vengeance for the holy prophet. Allah is great!" I was then thrown like an old rubbish sack into the van... I had lost all humanity in their eyes. Noreen's husband, Ashiq Masih, 51 years old at the time, announced that he planned to appeal the verdict, which has to be upheld by the Lahore High Court. A month later, Salmaan Taseer, the governor of Punjab who investigated the affair for the President Asif Ali Zardari, stated that Noreen would most likely be pardoned if the High Court did not suspend the sentence. Zardari was poised to grant pardon, but the High Court issued a stay order against potential Presidential pardon, which remains in force to date. Court transcripts show numerous inconsistencies in the evidence presented and reporters say they dare not repeat Bibi's testimony lest they also be accused of blasphemy. Noreen was put in solitary confinement in an 8-by-10-foot (2.4 m × 3.0 m) cell without windows at the Lahore prison. Before his assassination, Taseer visited her at the jail several times with his wife, Aamna, and daughter, Shehrbano, though Pakistani court officials later ruled that she could be visited only by her husband and lawyer. Khalid Sheikh, the prison superintendent, said that while he wanted her to be treated "like any other prisoner", she had to be kept away from other inmates for her own well-being, as other individuals accused of blasphemy had been killed while in prison. The Masihi Foundation, a human rights group, described her physical condition as "very frail", and her health was reported to be in decline due to poor living conditions at the jail. She has also been threatened by other inmates and subjected to physical abuse from prison guards. According to Human Rights Watch, Noreen's situation is not unusual. Though no one has been executed for blasphemy yet in Pakistan, the accused often remain imprisoned for a long time while the case is being processed. In May 2014, Noreen's appeal hearing was delayed for the fifth time. Noreen's conviction led to divided opinions on the blasphemy laws and drew strong reactions from the public. Pakistani Human Rights Watch researcher Ali Dayan Hasan said, "The law creates this legal infrastructure which is then used in various informal ways to intimidate, coerce, harass and persecute." He further described the law as "discriminatory and abusive". Punjab Governor Salmaan Taseer and Pakistan's Minority Affairs Minister Shahbaz Bhatti both publicly supported Noreen, with the latter saying, "I will go to every knock for justice on her behalf and I will take all steps for her protection." She also received support from Pakistani political scientist Rasul Baksh Rais and local priest Samson Dilawar. The imprisonment of Noreen left Christians and other minorities in Pakistan feeling vulnerable, and liberal Muslims were also unnerved by her sentencing. The general population was less sympathetic towards Noreen. Several signs were erected in Sheikhupura and other rural areas declaring support for the blasphemy laws, including one that called for Noreen to be beheaded. Mohammad Saleem, a member of the Jamiat Ulema-e-Pakistan party, organized a demonstration in Rawalpindi and led a small crowd chanting, "Hang her, hang her." In December 2010, a month after Noreen's conviction, Maulana Yousaf Qureshi, the Muslim cleric of the Mohabaat Khan Mosque in Peshawar, announced a ₨500000 (US$4,700) Pakistani rupee bounty to anyone who would kill her. One survey reported that around 10 million Pakistanis had said that they would be willing to personally kill her out of either religious conviction or for the reward. The village mosque in Ittan Wali was reportedly indifferent towards Noreen's plight; its imam, who helped register the case against her, Qari Mohammed Salim, stated that he had wept for joy on learning that she had been sentenced to death and threatened that some people would "take the law into their own hands" should she be pardoned or released. However, journalist Julie McCarthy suggested that the country's "more peaceful majority views" had been overshadowed by the more vocal fundamentalists. Noreen's family has received threats and has gone into hiding. Ashiq, her husband, stated that he was afraid to let their children go outside. He also expressed concern about how Noreen would be kept safe should she be released, saying, "No one will let her live. The mullahs are saying they will kill her when she comes out." Her family declined to leave the country while she remained in prison, but Italy, France, and Spain all offered to grant her and her family asylum in the event of her release. On 4 January 2011, at Kohsar Market of Islamabad, governor of Punjab Salmaan Taseer was assassinated by Malik Mumtaz Hussein Qadri, a 26-year-old member of his security team, because of his defence of Noreen and opposition to the blasphemy law. Mumtaz Qadri was sentenced to death for the assassination and hanged on 29 February 2016. Taseer was outspoken in his criticism of the law and the verdict in Noreen's case. The next day, thousands turned up for the governor's funeral in Lahore in spite of warnings by the Taliban and some clerics, while a portion of the Pakistani population also praised Qadri as a hero; thousands of Sunni Muslims rallied in support of the blasphemy laws in Pakistan after the murder, and 500 Barelvi clerics prohibited their followers from sending condolences to the family of Taseer. This resulted in concerns that the public was becoming tolerant of extremists. Prison officials said that Noreen "wept inconsolably" on learning of Taseer's assassination while repeatedly saying, "That man came here and he sacrificed his life for me." Father Andrew Nisari, a senior Catholic spokesperson in Lahore, described the situation as "utter chaos". Seven months later, in August 2011, Taseer's 28-year-old son, Shahbaz, was kidnapped. Shahbaz Taseer was later found or released in March 2016, and he returned to Lahore on 9 March after five years in captivity. Minority Affairs Minister Shahbaz Bhatti said that he was first threatened with death in June 2010 when he was told that he would be beheaded if he attempted to change the blasphemy laws. In response, he told reporters that he was "committed to the principle of justice for the people of Pakistan" and willing to die fighting for Noreen's release. On 2 March 2011, Bhatti was shot dead by gunmen who ambushed his car near his residence in Islamabad, presumably because of his position on the blasphemy laws. He had been the only Christian member of Pakistan's cabinet. Noreen's death sentence drew international outrage and strong condemnation from non-governmental organizations defending persecuted Christians, as well as human rights groups such as Amnesty International and Human Rights Watch who saw the blasphemy laws as a form of religious persecution and called for them to be abolished. Pope Benedict XVI publicly called for clemency for Noreen. In his statement, he described his "spiritual closeness" with Noreen and urged that the "human dignity and fundamental rights of everyone in similar situations" be respected. Her case also achieved extensive media coverage, and American journalist John L. Allen, Jr. wrote that she is "almost certainly the most famous illiterate Punjabi farm worker and mother of five on the planet". According to Allen, she has become a celebrity among Christian activists, an unusual instance when cases of discrimination against Christian minorities typically receive little attention in the press. A number of campaigns have been organized to protest her imprisonment through online petitions, Twitter trends, and concerts. Ooberfuse, a Christian pop band based in the United Kingdom collaborated with the British Pakistani Christian Association, and released a song titled "Free Asia Bibi" with a music video that included "a disturbing visual portrayal of the squalid prison conditions where Bibi is being held". She has also been the subject of books and documentaries. One petition created by the Voice of the Martyrs, an organisation aiding persecuted Christians, received over 400,000 signatures from individuals from over 100 countries. Another petition, organised by the American Center for Law & Justice (ACLJ), obtained over 200,000 signatures and called for America's aid to Pakistan (said to be cumulatively eight billion dollars) to stop whilst persecution of minorities is allowed in that country. Umar Al-Qadri, an Islamic cleric in Ireland, called for Noreen's release and stated he would back organisations wishing the same, holding that, "Asia Bibi is a case where the lady is denying that she committed blasphemy, and based on that it would be sufficient for the court to release her, but unfortunately that particular law, the blasphemy law in Pakistan, does not represent the true Islamic teaching". On 16 October 2014, the Lahore High Court dismissed Noreen's appeal and upheld her death sentence. On 20 November 2014, her husband appealed to the President of Pakistan for clemency. On 24 November 2014, her lawyer appealed to the Supreme Court of Pakistan. On 22 July 2015, the Supreme Court suspended Bibi's death sentence for the duration of the appeals process. In November 2015, Bibi's lead attorney, Naeem Shakir, announced that, after two postponements in 2015, the Supreme Court would hear an appeal in Bibi's case on 26 March 2016. The hearing was rescheduled for 13 October 2016, but on that morning when it was the turn of the case "Asia Bibi against the state", one of the three members of the bench of judges of that section – Iqbal Hameedur Rehman – refused to be part of the bench, which led to the postponement of the hearing to an undetermined date. The Judge later resigned in a handwritten letter addressed to Mamnoon Hussain, the President of Pakistan, without stating any specific reasons for his resignation. On 26 April 2017, Chief Justice of Pakistan (CJP) Mian Saqib Nisar declined a request for the early hearing of the case of Asia Bibi in the first week of June made by her lawyer Saiful Malook. 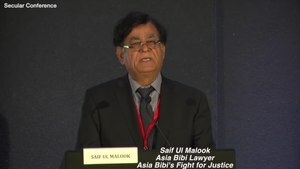 Asia's lawyer Saif Ul Malook spoke about the case at the Secular Conference on 25 November 2018, invited by Maryam Namazie shortly after he fled to the Netherlands. The final judgment said that one of Noreen's accusers violated the Ashtiname of Muhammad, a "covenant made by Muhammad with Christians in the seventh century but still valid today". Judge Khosa also stated that the two women who made accusations against Noreen "had no regard for the truth" and that the claim that she blasphemed Muhammad in public was a "concoction incarnate". The Supreme Court of Pakistan's ruling cited "material contradictions and inconsistent statements of the witnesses" that "cast a shadow of doubt on the prosecution's version of facts." Asia Noreen was reading the Christian Bible when she heard the news, upon which exclaimed "I can't believe what I am hearing, will I go out now? Will they let me out, really? ... I just don't know what to say, I am very happy, I can't believe it." Noreen's daughter Eisham Ashiq, said that the news of the acquittal was "the most wonderful moment in my life ... I want to hug my mother and then celebrate with my family. I am grateful to God for listening to our prayers." In response to the verdict, Islamist groups protested in the streets of Pakistan, "blocking roads and damaging infrastructure". The Supreme Court decision sparked protests in Lahore, Islamabad, Karachi, Peshawar and Multan. JUI-F chief Fazal-ur-Rehman called for "peaceful" protests stating that Bibi's release was "not acceptable at any cost". Tehreek-i-Labbaik Pakistan (TLP) chief Khadim Hussain Rizvi and Jamaat-i-Ahle Hadees also called for protests. Protesters belonging to the TLP party said traffic will "remain blocked until Asia Bibi is hanged." and Islamabad's main highway was blocked by "approximately a thousand club-wielding demonstrators". Muhammad Afzal Qadri, a TLP co-founder, Afzal Qadri also called for the death of the three Supreme Court justices involved in hearing Bibi's appeal, stating "The Chief Justice and two others deserve to be killed ... Either their security guards, their drivers, or their chefs should kill them." The Red Zone of Islamabad was sealed off from the public in order to keep protesters away, with paramilitary forces being deployed to this end. Prime Minister Imran Khan in a televised address to the nation on the Asia Bibi verdict, issued a stark warning to the groups that were agitating against the decision. He concluded his address stating, "do not take the state to a point where it has no option but to take action". On 1 November, the National Highways and Motorway Police advised commuters to "refrain from travelling on motorways and national highways" on account of "the law & order situation across the country". Christian schools in Lahore "closed indefinitely" for safety reasons following the protests. The government of Pakistan also shut down mobile phone networks on 2 November. Before the announcement of the acquittal on 31 October, Christians in Pakistan fasted and prayed. Cardinal Joseph Coutts, Roman Catholic Archbishop of Karachi, prayed that "there may not be a violent reaction from the extremists". Saif-ul-Mulook, the lawyer who defended Asia Noreen, states that "his life has not been the same since; he rarely socialises, lives in a constant state of hypervigilance and has been inundated with threats." The South China Morning Post and Christian Today reported that he is now an "easy target" for extremists. On 3 November 2018, he was reported as "having fled" the country, to the Netherlands. Saif-ul-Mulook maintains that the United Nations "kept me for three days and then put me on a plane against my wishes" as he "refused to leave the country without ensuring that his client was out of prison." Religious hardliners petitioned to overturn the acquittal. The decision was praised by human rights groups and organizations advocating for persecuted Christians, such as International Christian Concern, Open Doors, and Aid to the Church in Need. CEO of Open Doors David Curry, said: "We are breathing a sigh of relief today ... as these charges stemmed from her Christian identity as well as false accusations against her. We are hopeful that Pakistan will now take additional steps to offer religious freedom and basic human rights throughout the country." Omar Waraich, Amnesty International's Deputy South Asia Director, described the ruling as a "landmark verdict". Neville Kyrke-Smith of Aid to the Church in Need proclaimed with respect to Asia Noreen's acquittal: "Today is like the dawn of new hope for oppressed minorities." The Human Rights Commission of Pakistan issued a statement on 1 November welcoming the acquittal, stating that "From a human rights perspective, the Supreme Court's detailed judgment underlines several of the most problematic aspects of applying the blasphemy laws. The presumption of innocence is too easily buried by moral outrage, which invariably pits the vulnerable and underprivileged against those in majority." Olav Fykse Tveit, general secretary of the World Council of Churches, "received with joy" news of the acquittal, stating: "We celebrate her acquittal and release together with her, her family and community ... The WCC has repeatedly called for justice for Asia Bibi, convicted 8 years ago on charges resulting from a village argument in which she was accused by her neighbours of blasphemy. ... WCC therefore appeals once again to the Government of Pakistan to review its blasphemy laws, to curb their abuse, and to eliminate discriminatory bias against religious minorities." United Nations: UN Deputy Spokesman Farhan Haq said that because of the organization's long-standing opposition to the death penalty, it "would welcome this latest development". United Kingdom: Theresa May, the prime minister of the United Kingdom, stated that "the news would be welcomed around the world, and the UK was committed to the global abolition of the death penalty." According to the British Pakistani Christian Association, Bibi appealed to Britain for asylum but was denied because her presence in the country might stir unrest among "certain sections of the population". United States: The United States Commission on International Religious Freedom (USCIRF) Chair Tenzin Dorjee lauded the ruling, saying "The case of Asia Bibi illustrates the extent to which blasphemy laws can be exploited to target minority communities. These laws seek to protect entire religions rather than the individual, as should be the case under international human rights standards. It is deeply troubling that Bibi's case even reached this level, where she almost became the first person in Pakistan's history to be executed for the crime of blasphemy." France: Marine Le Pen, president of the National Rally in France called on her government to grant Asia Noreen asylum. The European branch of the American Center for Law and Justice lauded the ruling as well, and advocated the "abolition of the crime of blasphemy in Pakistan". Several countries, including France and Spain, have offered Asia Noreen asylum. On 2 November 2018, the Government of Pakistan under the administration of Imran Khan and the Islamist Tehreek-e-Labbaik political party, which encouraged the protests against Asia Bibi, came to an agreement that barred Asia Bibi from leaving the country, in addition to releasing Tehreek-e-Labbaik protesters. Noor-ul-Haq Qadri, the religious affairs minister, and Muhammad Basharat Raja, Punjab's minister for law, signed the agreement on behalf of the government. The deal includes expediting a motion in the court to place Asia Noreen on Pakistan's no fly list, known officially as the Exit Control List (ECL). Pakistani authorities will not release Asia Noreen until the "Supreme Court makes a final review of its verdict" as "Ghulam Mustafa, the lawyer representing a provincial cleric in Punjab who had filed the initial blasphemy charges against Bibi, petitioned the Supreme Court requesting that the judges review her acquittal." Similar reviews have taken years to process. The TLP agreed to end its three-day protest sit-ins across the country and its leaders asked the protesters to disperse peacefully. A plane from the United Kingdom reportedly arrived to pick up Asia Noreen after her acquittal but returned without her, as the Pakistani government currently still has her under detention as a result of the agreement with Tehreek-e-Labbaik. Wilson Chowdhry, chairman of the British Pakistani Christian Association (BPCA), stated that "Placing Asia Bibi on the ECL is like signing her death warrant". This agreement between the Government of Pakistan and Tehreek-e-Labbaik has led to "allegations [that] the government was capitulating to extremists". Pakistani Information Minister Fawad Chaudhry responded to these allegations, saying that "We had two options: either to use force, and when you use force people can be killed. That is not something a state should do... We tried negotiations and (in) negotiations you take something and you leave something." Asia Noreen's lawyer Saif-ul-Mulook called the agreement between the Government of Pakistan and the Islamists "painful", stating that "They cannot even implement an order of the country's highest court". Feeling that his life was threatened, Mulook fled to Europe in order "to stay alive as I still have to fight the legal battle for Asia Bibi." BPCA chairman Wilson Chowdhry likewise stated that "I am not surprised that Imran Khan's regime has caved in to extremists". Jemima Goldsmith, an ex-wife of Imran Khan, similarly "said that Pakistan's government caved in to extremist demands to bar Asia Bibi from leaving the country", opining "Not the Naya Pakistan we'd hoped for. 3 days after a defiant & brave speech defending the judiciary, Pakistan's gov caves in to extremist demands to bar Asia Bibi from leaving Pakistan, after she was acquitted of blasphemy- effectively signing her death warrant." Ashiq Masih, the husband of Asia Noreen, appealed to President of the United States Donald Trump, as well as Theresa May, Prime Minister of the United Kingdom and Justin Trudeau, Prime Minister of Canada, to "help the family leave the country" and grant them asylum. He told the charity Aid to the Church in Need, an organisation that aids persecuted Christians: "Help us get out of Pakistan. We are extremely worried because our lives are in danger. We no longer have even anything to eat, because we cannot leave the house to buy food". On 7 November 2018, a release order arrived at New Jail for Women in which Asia Bibi was incarcerated at in Multan. Local news reported that she had been flown to PAF Base Nur Khan and would depart the country on a charter plane to the Netherlands. However, the Ministry of Foreign Affairs denied the media reports that Asia Bibi had left Pakistan, stating that she was "in a safe place in Pakistan". Hafiz Shahbaz Attari of the Islamist political party Tehreek-e-Labbaik Pakistan (TLP), upon hearing the news, said that TLP members would gather in Islamabad and Rawalpindi and try to prevent her departure. Another TLP leader Afzal Qadri, stated that "officials told the group that Bibi would not be allowed to leave until the Supreme Court rules on their appeal of her acquittal". British Member of Parliament Mike Gapes, then of the Labour and Co-operative Party, suggested in November 2018 that the UK should reassess their relationship with Pakistan, and Rehman Chishti resigned as Britain's trade envoy to Pakistan in the same month, partially in protest to the government's refusal to offer Asia Bibi asylum. US Senator Rand Paul spoke to President Donald Trump about securing asylum for Asia Bibi in that nation. Asia Bibi was reported to have spent Christmas Day (25 December) 2018 in custody. Joseph Nadeem, the man guarding Noreen's husband and family, said that Islamists had fired at the gate of their home and that they had to move five times in order to evade them. EU: Antonio Tajani, the President of the European Parliament, stated "The European Parliament is extremely concerned for your safety as well as your family's, due to the violence by extremist elements in Pakistan". Tajani sent a letter to Asia Bibi's husband, inviting his family to "Brussels or Strasbourg for a meeting about how I can concretely facilitate the release of your wife, Asia Bibi". Italy: Matteo Salvini, the Deputy Prime Minister of Italy, stated that "I want women and children whose lives are at risk to be able to have a secure future, in our country or in other Western countries, so I will do everything humanly possible to guarantee that [for Bibi] ... It is not permissible that in 2018 someone can risk losing their life for a ... hypothesis of blasphemy". Salvini further stated that "Italy had nothing against the Pakistani government" but that the "enemy is violence, extremism and fanaticism". Canada: Chrystia Freeland, the Minister of Foreign Affairs of Canada, stated that "It's a very important issue, a central priority for our government ... Canada calls on Pakistan to take all measures necessary to ensure the safety and security of Asia Bibi and her family ... Canada is prepared to do everything we can and is extremely engaged in this issue." Australia: Peter Dutton, the Minister for Home Affairs, said that Australia will offer asylum to Asia Bibi. On 29 January 2019, Pakistan's Supreme Court upheld the acquittal and ruled that she was now free to leave Pakistan, where she was facing death threats, and join members of her family who were (according to unconfirmed reports) already abroad. Violent protests erupted across Pakistan, demanding the execution of the judge and Asia Bibi. While her lawyer, who escaped to Germany, says that Asia is in Canada, others allege that she is being held in a secret location in Islamabad and that it is not clear when she will leave or where she will go. France, Spain, the Netherlands, Germany, Italy, and Australia were among the countries who offered asylum to Asia Bibi. In the Pakistani city of Faizabad, fifty-five people were arrested during a protest of the decision to uphold the Supreme Court's acquittal decision. On 11 April 2019, Pakistani Prime Minister Imran Khan stated that a "complication" has delayed the departure of Asia Bibi from the country. Human rights campaigner Aman Ullah stated that Asia Bibi remains locked in a single room in which the door only opens during meal times. French journalist Anne-Isabelle Tollet [fr] assisted Noreen in writing a memoir titled Blasphemy: A Memoir: Sentenced to Death over a Cup of Water (2013, ISBN 1613748892). Noreen is illiterate, and Tollet was unable to visit her directly due to prison restrictions. She conducted interviews through Noreen's husband, who passed questions and answers between them. Tollet also met other members of Noreen's family, including her children and sister, and had known Shahbaz Bhatti before his assassination. In 2015, Polish filmmakers, inspired by the memoir, produced the film Uwolnić Asię Bibi (English: Freedom for Asia Bibi). ^ a b Kazim, Hasnain (19 November 2010). "Eine Ziege, ein Streit und ein Todesurteil" [A goat, a fight and a death sentence]. Der Spiegel (in German). Retrieved 19 November 2010. ^ "Fear for Pakistan's death row Christian woman". BBC News. 5 December 2010. Archived from the original on 6 December 2010. Retrieved 5 December 2010. ^ a b c "Asia Bibi: Pakistan acquits Christian woman on death row". BBC. 31 October 2018. Retrieved 31 October 2018. Chief Justice Saqib Nisar read out the ruling saying she was free to go, if not wanted in connection with any other case. ^ a b "Pakistan delays release of Christian woman after blasphemy acquittal". CBN News. 2 November 2018. Retrieved 2 November 2018. ^ a b c d e "Christian woman cleared of blasphemy barred from leaving Pakistan". The Telegraph. 2 November 2018. Retrieved 2 November 2018. ^ a b "Asia Bibi Could Leave Pak After Court Upholds Acquittal In Blasphemy Case". NDTV. 29 January 2019. ^ a b Shackle, Samira (18 October 2018). "The Lahore court's decision to uphold Asia Bibi's death penalty is far from just". The Guardian. Retrieved 1 November 2018. Bibi's alleged blasphemous comments were supposedly made after co-workers refused to share water that she had carried; they said it was unclean because she was a Christian (this is a hangover from the caste system, as most of those who converted to Christianity in pre-partition India were members of the lower castes). ^ a b Zakaria, Rafia (16 October 2018). "A Death Sentence Over a Cup of Water?". The New Republic. Retrieved 1 November 2018. The question of drinking order is a vestige of the Hindu caste system that has lingered in the area even after most of the population converted to Islam over a hundred years ago. Christians, believed to be converts from Dalits, continue to be treated as untouchables in parts of Pakistan. For high Brahmans, using the same utensils as someone from a lower caste represented contamination or impurity. It seems the women in the field with Asia Bibi on that ill-fated June day believed this as well. ^ a b c d Lane, Gary (10 November 2011). "Awaiting Justice: Asia Bibi Supporters Call for Mercy". CBN News. Retrieved 25 November 2013. ^ Murashko, Alex (23 July 2011). "Global Petition Launched to Save Asia Bibi". International Christian Concern. Retrieved 31 October 2018. ^ Bacon, John (31 October 2018). "Blasphemy: Pakistan frees Asia Bibi, a Christian, from death row". USA Today. Retrieved 31 October 2018. ^ a b "Final Hearing For Asia Bibi: Will Pakistani Christian Woman Be Hanged For Blasphemy?". Christian Today. 10 October 2018. Retrieved 1 November 2018. Two prominent politicians, governor of Punjab Salmaan Taseer and minority affairs minister Shahbaz Bhatti, were assassinated in 2011 after defending Bibi. Her lawyer, Saiful Malook, is a Muslim who claims that Pakistani officials have been influenced by religious hardliners. He has also been targeted by Islamic fundamentalists. ^ "Militants say killed Pakistani minister for blasphemy". Reuters. 2 March 2011. ^ a b c d e f g h i j k Guerin, Orla (6 December 2010). "Pakistani Christian Asia Bibi 'has price on her head'". BBC. Archived from the original on 7 December 2010. Retrieved 6 December 2010. ^ a b "Blasphemy case: Cleric offers Rs500,000 for Aasia's execution". The Express Tribune. 3 December 2010. Retrieved 1 November 2018. Maulana Yousaf Qureshi, the Khateeb of the historic Masjid Mohabaat Khan in Peshawar, offered a Rs500,000 reward for anyone who kills Aasia, Online news agency reported. ^ a b c d e Aqeel, Asif (31 October 2018). "Pakistan Frees Asia Bibi from Blasphemy Death Sentence". Christianity Today. Retrieved 31 October 2018. In their final judgment, reviewed by CT, reversing Bibi's convictions by two lower courts and removing her death sentence, the panel of three judges ruled that Bibi was "wrongly" accused by two sisters with the help of a local cleric, based on "material contradictions and inconsistent statements of the witnesses" that "cast a shadow of doubt on the prosecution's version of facts." "Furthermore, the alleged extra-judicial confession was not voluntary but rather resulted out of coercion and undue pressure as the appellant was forcibly brought before the complainant in presence of a gathering, who were threatening to kill her; as such, it cannot be made the basis of a conviction," they wrote. "Therefore, the appellant being innocent deserves acquittal," the judges concluded. One even accused Bibi's accusers of violating a covenant made by Muhammad with Christians in the seventh century but still valid today. "Blasphemy is a serious offence," wrote justice Asif Saeed Khosa, "but the insult of the appellant's religion and religious sensibilities by the complainant party and then mixing truth with falsehood in the name of the Holy Prophet Muhammad (Peace Be Upon Him) was also not short of being blasphemous. ^ a b "Islamists block roads in Pakistan over Asia Bibi blasphemy case". Deutsche Welle. 1 November 2018. Retrieved 1 November 2018. Islamists launched protests after the country's Supreme Court ruled to acquit Bibi of blasphemy in a widely publicized case. ^ a b Sophie Williams (1 November 2018). "Asia Bibi case: Thousands protest in Pakistan for second day over the acquittal of Christian woman sentenced to death for blasphemy". Evening Standard. Retrieved 1 November 2018. Radical Islamists mounted rallies against the verdict, blocking roads and burning tyres in protest as they demanded she be executed. ^ a b c Sophia Saifi and James Griffiths (31 October 2018). "Pakistani Christian Asia Bibi has death penalty conviction overturned". CNN. Retrieved 31 October 2018. ^ a b Sherwood, Harriet (31 October 2018). "Quashing of Asia Bibi's blasphemy charge will not end her suffering". The Guardian. Retrieved 31 October 2018. ^ a b c d e Peter Stubley (3 November 2018). "Asia Bibi: Pakistan government stops Christian woman leaving country after 'caving in' to hardline Islamists". The Independent. Retrieved 2 November 2018. Under the terms of the deal made on Friday night, prime minister Imran Khan's administration said it would begin legal proceedings to place Asia Bibi on the "exit control list" (ECL). ... "I am not surprised that Imran Khan's regime has caved in to extremists," said Wilson Chowdhry, chair of the British Pakistani Christian Association. ^ a b "Asia Bibi Barred From Leaving Pakistan as Imran Khan Govt Strikes Deal With Islamist Protesters". News 18. 2 November 2018. Retrieved 2 November 2018. ^ a b "Govt & Tehreek-e-Labbaik reach agreement to end protests". Radio Pakistan. 2 November 2018. Retrieved 2 November 2018. ^ a b "Pakistan Makes Concessions to Protesters in Blasphemy Case". The New York Times. 2 November 2018. Retrieved 2 November 2018. ^ a b c "Asia Bibi: Deal to end Pakistan protests over blasphemy case". BBC. 2 November 2018. Retrieved 2 November 2018. ^ a b "Jemima says Pakistan's govt caves in to extremist demands to bar Asia Bibi from leaving". The International News. 4 November 2018. Retrieved 4 November 2018. ^ a b "Cleared In Blasphemy Case, Asia Bibi To Still Spend Christmas In Custody". NDTV. 23 December 2018. ^ a b "Exonerated but still not free: Pakistan's Asia Bibi to spend Christmas in custody". SBS News. 24 December 2018. ^ a b c "Asia Bibi blasphemy acquittal upheld by Pakistan court". BBC News. 29 January 2019. Archived from the original on 29 January 2019. Retrieved 30 January 2019. ^ a b Williams, Alex (11 April 2019). "Pakistan's PM says 'complication' delaying Asia Bibi's exit". Premier Christian Radio. Retrieved 14 April 2019. ^ Hashim, Asad (17 May 2014). "Living in fear under Pakistan's blasphemy law". Al Jazeera. Retrieved 21 November 2014. In Pakistan, 17 people are on death row for blasphemy, and dozens more have been extrajudicially murdered. ^ "Part-time spine, Is the Pakistani state capable of standing up to blackmail? ", The Economist: 40, 10 November 2018, retrieved 19 November 2018, several hundred people have been charged,...No one has yet been executed. But more than 50 people accused of blasphemy have been murdered. ^ "Muslims Block Roads, Call for Supreme Court Justices to Be Killed Over Asia Bibi Acquittal". The Christian Post. 31 October 2018. Retrieved 1 November 2018. In Pakistan, blasphemy (insulting Islam or its prophet Muhammad) is a crime punishable by life imprisonment or death. The law is often abused by Muslims looking to settle scores with religious minorities. Bibi has denied the accusations. In response to the court's announcement that a three-judge panel reversed earlier court rulings against Bibi on grounds that evidence against her was insufficient, TLP supporters have reportedly staged street protests and have also blockaded major roadways. ^ a b Dayan Hasan, Ali (15 November 2010). "Pakistan: Filthy Business". Human Rights Watch. Retrieved 13 January 2014. ^ a b c d Hussain, Waqar (11 November 2010). "Christian Woman Sentenced to Death". Agence France-Presse. Archived from the original on 14 November 2010. Retrieved 11 November 2010. ^ a b c Crilly, Rob; Sahi, Aoun (9 November 2010). "Christian Woman sentenced to Death in Pakistan for blasphemy". The Daily Telegraph. London. Archived from the original on 11 November 2010. Retrieved 11 November 2010. ^ a b c d e f Allen 2013, p. 36. ^ Munir, Manzer (7 December 2010). "Aasia Bibi and Impurities in the Land of the Pure". Digital Journal. Retrieved 7 December 2010. ^ a b c d Walsh, Declan (8 January 2011). "Salmaan Taseer, Aasia Bibi and Pakistan's struggle with extremism". The Guardian. Retrieved 3 March 2011. ^ a b c d e Allen 2013, p. 35. ^ a b c d e f McCarthy, Julie (14 December 2010). "Christian's Death Verdict Spurs Holy Row In Pakistan". NPR. Retrieved 27 November 2013. ^ Perlez, Jane (22 November 2010). "Pakistani Sentenced to Death May Get a Pardon". The New York Times. Retrieved 25 November 2013. ^ a b El Shafie 2012, p. 16. ^ a b c d e "'I'm Afraid She'll Be Killed Very Soon if Nothing Happens'". Christianity Today. 23 September 2013. Retrieved 25 November 2013. ^ Barker, Memphis (31 October 2018). "Asia Bibi: Pakistan court overturns blasphemy death sentence: Christian woman to be freed after being sentenced in 2010, accused of insulting prophet Muhammad". The Guardian. Retrieved 31 October 2018. Christian farm labourer Bibi, a 47-year-old mother of five, was sentenced to hang for blasphemy in 2010. She had angered fellow Muslim farm workers by taking a sip of water from a cup she had fetched for them on a hot day. When they demanded she convert to Islam, she refused, prompting a mob to later allege that she had insulted the prophet Mohammed. ^ a b "Salman Taseer: Thousands mourn Pakistan governor". BBC News. 5 January 2011. Retrieved 25 November 2013. ^ a b Reza Sayah, Nasir Habib (11 November 2010). "Christian woman sentenced to death for blasphemy in Pakistan". CNN. Retrieved 1 November 2018. ^ a b "Muslim leaders who issued decree to kill a Christian woman should be prosecuted". Asian Human Rights Commission. 8 December 2010. Retrieved 1 November 2018. ^ a b c Marshall 2013, p. 195. ^ Shea, Nina (2 March 2012). "Pakistan's Honorable Shahbaz Bhatti, Murdered with Impunity One Year Ago". National Review Online. Archived from the original on 7 April 2013. Retrieved 7 January 2014. ^ Sayah, Reza; Habib, Nasir (11 November 2010). "Christian Woman Sentenced to Death for Blashemy in Pakistan". CNN. Archived from the original on 12 November 2010. Retrieved 11 November 2010. ^ St. John, Hal (14 June 2012). "'Ten million people now want to kill me'". Catholic Herald. Retrieved 28 November 2013. ^ "Asia Bibi". Jang. Pakistan. 25 November 2010. Archived from the original on 18 December 2010. Retrieved 11 January 2011 . ^ Henderson L, Agrawal A (23 November 2010). "Pakistan's president will pardon Christian woman, official says". CNN. Archived from the original on 24 November 2010. Retrieved 30 November 2010. ^ "LHC stays Aasia release under Presidential order". The News. Pakistan. 29 November 2010. Archived from the original on 29 November 2010. Retrieved 19 March 2017. ^ a b Akkara, Anto (20 July 2012). "International Clamor for Asia Bibi's Release Grows". National Catholic Register. Retrieved 27 November 2013. ^ "Blasphemy in Pakistan: The case of Aasia Bibi". Al Jazeera. 15 June 2015. ^ a b c d e "'Salmaan Taseer came here and he sacrificed his life for me'". The Independent. 8 January 2011. Retrieved 27 November 2012. ^ Rita Panahi (1 November 2018). "Asia Bibi is innocent but she'll never be safe in Pakistan". Herald Sun. Retrieved 1 November 2018. Since that day in 2009, she has been in prison, in solitary confinement, in a 2.4 by 3m cell without a window. Bibi can't mix with other prisoners for fear that she'll be killed, which is often the fate of those accused of blasphemy in Pakistan. ^ "Aasia bibi 'very frail', not been taken seriously: NGO". The Express Tribune. 21 December 2011. Retrieved 8 January 2014. ^ a b Tanveer, Rana (29 June 2013). "Blasphemy convict: Aasia Bibi's appeal at least two years away". The Express Tribune. Retrieved 8 January 2014. ^ Crilly, Rob (9 November 2010). "Christian woman sentenced to death in Pakistan 'for blasphemy'". The Telegraph. Retrieved 13 January 2014. ^ "Pakistan: Asia Bibi case delayed for fifth time, court seeks to pardon TV staff". Global Dispatch. 28 May 2014. Retrieved 2 June 2014. ^ a b Brulliard, Karin (26 November 2010). "Both sides in blasphemy case pressure Zardari". The Washington Post. Retrieved 27 November 2013. ^ Hughes 2012, p. 138. ^ a b c Anthony, Augustine (2 March 2011). "Militants say killed Pakistan minister for blasphemy". Reuters. Retrieved 2 March 2011. ^ Ali, Muhammad Faisal (27 August 2011). "Slain Salman Taseer's son kidnapped". The Dawn. Retrieved 11 September 2012. ^ Boone, Jon (9 March 2016). "Shahbaz Taseer: Pakistan's high-profile kidnap victim reunited with family". The Guardian. ^ Sayah, Reza (24 November 2010). "Pakistan president urged not to pardon Christian woman". CNN. Retrieved 27 November 2013. ^ "Pope Benedict urges freedom for Asia Bibi". Dawn.com. 17 November 2010. Retrieved 28 November 2013. ^ Crilly, Rob (18 November 2010). "Pope Benedict XVI calls for release of Christian sentenced to hang in Pakistan". The Daily Telegraph. Retrieved 27 November 2013. ^ ooberfuseband (14 October 2018). "Ooberfuse ft Wizard MC – Free Asia Bibi" – via YouTube. ^ "Not One More Dime for Persecution". American Center for Law and Justice. ^ Greg Daly (25 October 2018). "Top Muslim calls for Asia Bibi's release". The Irish Catholic. ^ AFP (16 October 2014). "LHC upholds blasphemy convict Asia Bibi's death penalty". Dawn.com. Retrieved 16 October 2014. ^ "Asia Bibi's husband asks President Mamnoon for pardon". DAWN. 20 November 2014. ^ "On death row for blasphemy, Asia Bibi makes final appeal to SC". DAWN. 24 November 2014. ^ "Pakistan Supreme Court suspends Asia Bibi death sentence". BBC. 22 July 2015. ^ "Pakistan court to hear appeal by woman sentenced to death for blasphemy". CNN. 22 July 2015. ^ "Asia Bibi, a new hearing on March 26". Official Vatican Network. 14 November 2015. ^ a b "ASIA/PAKISTAN – The Supreme Court judge, who refused to hear Asia Bibi's death penalty appeal, resigns". news.va. Retrieved 23 July 2017. ^ "ASIA/PAKISTAN – The hearing of the Supreme Court for the case of Asia Bibi postponed". news.va. Retrieved 23 July 2017. ^ "Pakistan SC declines early hearing of Asia Bibi case". news.va. Retrieved 23 July 2017. ^ "Supreme Court reserves verdict on Asia Bibi's appeal against death sentence". The News International. 8 October 2018. ^ a b Bhatti, Haseeb (31 October 2018). "SC acquits Asia Bibi, orders immediate release". Dawn. ^ Malik, Hasnaat (31 October 2018). "Aasia Bibi acquitted by Supreme Court". Express Tribune. ^ a b c "Asia Bibi: Pakistan acquits Christian woman on death row". BBC. 31 October 2018. Retrieved 31 October 2018. ^ Iqbal, Zulqarnain (31 October 2018). "Protests break out after Pakistan's Supreme Court acquits Aasia Bibi". Samaa TV. ^ a b c d "Asia Bibi case: Justice Asif Saeed Khosa's additional note". The News International. 31 October 2018. Retrieved 31 October 2018. ^ Barker, Memphis (31 October 2018). "Asia Bibi: Pakistan court overturns blasphemy death sentence: Christian woman to be freed after being sentenced in 2010, accused of insulting prophet Muhammad". The Guardian. Retrieved 31 October 2018. Justice Asif Khosa, in a verdict widely praised for its courage and rigour, noted that the two sisters who accused Bibi "had no regard for the truth" and that the claim she smeared the prophet in public was "concoction incarnate". ^ Munir Ahmed and Asim Tanveer (1 November 2018). "Christian woman acquitted in Pakistan to leave country". The Washington Post. Retrieved 1 November 2018. A female commando who is part of a team of police and paramilitary troops deployed to protect Bibi, told The Associated Press that Bibi was reading a Bible when the news about her acquittal was conveyed to her. ^ Barker, Memphis (31 October 2018). "Asia Bibi: Pakistan court overturns blasphemy death sentence: Christian woman to be freed after being sentenced in 2010, accused of insulting prophet Muhammad". The Guardian. Retrieved 31 October 2018. ^ a b "Asia Bibi's blasphemy verdict: Islamists protest across Pakistan". Deutsche Welle. 31 October 2018. Retrieved 31 October 2018. ^ "Protests erupt in major cities as SC acquits Asia Bibi of blasphemy charges". The News International. 31 October 2018. ^ "Live blog: Protests on Asia Bibi's acquittal". Dawn. ^ Omer Farooq Khan (1 November 2018). "Pakistani Islamists are on the boil over acquittal of Asia Bibi". Times of India. Retrieved 1 November 2018. ^ Hashim, Asad (31 October 2018). "Pakistan PM calls for calm after Aasia Bibi cleared of blasphemy". Al Jazeera. Retrieved 31 October 2018. ^ "'Do not clash with the state': PM Khan issues stern warning to agitators after Asia Bibi verdict". Dawn. 1 November 2018. ^ "Asia Bibi: Imran Khan attacks hardliners over court case". BBC. 31 October 2018. The National Highways and Motorway Police has advised commuters to "refrain from travelling on motorways and national highways" on account of "the law & order situation across the country". ^ "Motorway Police tweet, 5:13 AM – 1 Nov 2018". Twitter. 1 November 2018. Dear Citizens, Keeping in view the law & order situation across the country, please refrain from travelling on Motorways and National Highways. For updated information regarding travel advisory please visit http://nhmp.gov.pk/TravelAdvisory.html … … … Stay tuned for more updates.". ^ Chaudhry, Kamran (31 October 2018). "Protests break out following Asia Bibi's acquittal. Christian schools close indefinitely in Lahore". AsiaNews. Retrieved 31 October 2018. As a result, in Lahore, Church authorities ordered the indefinite closure of Christian schools and asked parents to come and take their children home. Likewise, "Schools will remain closed till further notice," said a sign at St Peter's High School, which is run by the Diocese of Raiwind of the Church of Pakistan. ^ Osborne, Samuel (2 November 2018). "Asia Bibi: Protests stop Christian woman leaving Pakistan three days after court overturns blasphemy charge". The Independent. Retrieved 2 November 2018. Pakistan suspended mobile phone networks in major cities on Friday, and many schools were shut down as Islamist groups protested for the third day. ^ Barker, Memphis (31 October 2018). "Asia Bibi: Pakistan court overturns blasphemy death sentence". The Guardian. Retrieved 31 October 2018. In February, Pope Francis met Ashiq at the Vatican, and Pakistan's small Christian minority held fasts and prayer sessions before the verdict. ^ Gerard O'Connell (31 October 2018). "Pakistani Christians fear violence after Asia Bibi's blasphemy death sentence is overturned". America Magazine. Retrieved 1 November 2018. ^ a b c "Pakistani lawyer is now an 'easy target' for extremists after helping Asia Bibi escape execution for blasphemy". South China Morning Post. 1 November 2018. Retrieved 1 November 2018. ^ "Asia Bibi: Lawyer flees Pakistan in fear of his life". BBC News. 3 November 2018. Retrieved 3 November 2018. ^ "Asia Bibi: Lawyer flees Pakistan in fear of his life". NDTV. 5 November 2018. Retrieved 5 November 2018. ^ "UN denies forcing Asia Bibi lawyer to leave". The International News. 6 November 2018. Retrieved 6 November 2018. ^ "HRCP welcomes landmark Asia Bibi verdict". The International News. 1 November 2018. Retrieved 1 November 2018. ^ "WCC "receives with joy" verdict which resolves case of Asia Bibi". World Council of Churches. 1 November 2018. Retrieved 1 November 2018. ^ "Daily Press Briefing by the Office of the Spokesperson for the Secretary-General, 31 October 2018". United Nations. Retrieved 3 November 2018. ^ "UN welcomes SC's ruling to overturn Asia Bibi's death sentence". The International News. 1 November 2018. ^ "PMQs: Theresa May is asked about Asia Bibi case in Pakistan". BBC. 31 October 2018. Retrieved 31 October 2018. ^ "UK 'Won't Offer Asylum To Asia Bibi Amid 'Security Concerns'". HuffPost UK. 2018-11-09. Retrieved 2018-11-17. ^ "USCIRF Welcomes Pakistani Supreme Court's Decision to Overturn Death Sentence Against Asia Bibi". United States Commission on International Religious Freedom. 31 October 2018. ^ "Asia Bibi is Free". European Centre for Law and Justice. 31 October 2018. Retrieved 1 November 2018. ^ "Pakistan strikes deal to end protests over Asia Bibi blasphemy case". CNN. 3 November 2018. ^ Bilal, Rana (2 November 2018). "Government, TLP reach agreement; state to take legal measures to place Asia Bibi's name on ECL". Dawn. ^ Malik, Mansoor (3 November 2018). "TLP ends protest after deal with government". Dawn. ^ "PAKISTAN: Asia Bibi barred from leaving country". Church in Chains. 3 November 2018. Retrieved 3 November 2018. ^ "Asia Bibi's Release Delayed; Supreme Court to Review Acquittal Decision as Muslims Protest". The Christian Post. 2 November 2018. Retrieved 2 November 2018. ^ a b "Asia Bibi: Lawyer flees Pakistan in fear of his life". BBC. 3 November 2018. Retrieved 2 November 2018. ^ Shamil Shams (4 November 2018). "Asia Bibi's husband, Ashiq Masih, appeals to US President Donald Trump for asylum". Deutsche Welle. Retrieved 4 November 2018. ^ Stoyan Zaimov (7 November 2018). "Asia Bibi's 'Shattered' Family Begs for Help, Has 'Nothing to Eat;' Christian Mother Still Jailed". The Christian Post. Retrieved 7 November 2018. ^ a b c Zulqernain, M (7 November 2018). "Asia Bibi released from jail, to be shifted to the Netherlands". Outlook. Retrieved 7 November 2018. ^ "Pakistan's Asia Bibi freed from jail: lawyer". Gulf News. 7 November 2018. Retrieved 7 November 2018. A release order arrived Wednesday at the prison in the central city of Multan, where Bibi was detained, a prison official told AFP. ^ a b Constable, Pamela (8 November 2018). "Release of Christian woman acquitted of blasphemy roils Pakistan". Washington Post. Retrieved 8 November 2018. ^ "Pakistani Christian Freed After Being Cleared in Blasphemy Case". New York Times. 8 November 2018. Retrieved 8 November 2018. ^ "Pakistan blasphemy case: Asia Bibi freed from jail". The Guardian. 7 November 2018. Retrieved 7 November 2018. ^ Wintour, Patrick (13 November 2018). "Foreign Office 'allowed Pakistan mob to dictate Asia Bibi asylum case'". The Guardian. Retrieved 16 November 2018. ^ "Asia Bibi 'shunned' by UK officials, says Conservative MP". churchtimes.co.uk. Retrieved 2019-03-13. ^ Sadiq, Alena (15 November 2018). "Sen. Paul says he spoke to Trump about securing asylum for Pakistani Christian woman". Politico. Retrieved 16 November 2018. ^ Maule, Will (8 December 2018). "'Light Will Always Break Through the Darkness': President Trump's Hanukkah Message to Jews Around the World". CBN News. ^ "EU commits to "facilitate the release of Asia Bibi"". Evangelical Focus. 7 November 2018. Retrieved 7 November 2018. ^ a b c "Canada, Italy urge Pakistan to ensure Aasia Bibi's well-being". The Express Tribune. 7 November 2018. Retrieved 7 November 2018. ^ "Italy Working To Find Safe Home In West For Pakistani Christian Woman". Radio Free Europe. 7 November 2018. Retrieved 7 November 2018. ^ Bolt, Andrew (22 November 2018). "Australia to Offer Asylum to Asia Bibi". Herald Sun. ^ Sherwood, Harriet (2019-01-29). "Asia Bibi: Pakistan's top court upholds blasphemy acquittal". The Guardian. ISSN 0261-3077. Retrieved 2019-01-29. ^ Graham-Harrison, Emma (9 February 2019). "Asia Bibi: Pakistani authorities barring her from leaving, friend says". The Guardian. Retrieved 10 February 2019. ^ Bassey, Amardeep (29 January 2019). "Pakistani Who Was On Death Row For Blasphemy Headed To Canada: Friend". The Huffington Post. ^ "PAKISTAN: Asia Bibi's daughter pleads for her freedom". Church In Chains. 13 March 2019. Retrieved 14 April 2019. ^ "Uwolnić Asię Bibi" (in Polish). Film Web. 2015. Retrieved 1 November 2018. Allen, John L. (2013). The Global War on Christians: Dispatches from the Front Lines of Anti-Christian Persecution. Random House LLC. ISBN 0770437362. Hughes, Geraint (2012). My Enemy's Enemy: Proxy Warfare in International Politics. Apollo Books. ISBN 1845194497. Marshall, Paul (2013). Persecuted: The Global Assault on Christians. Thomas Nelson Inc. ISBN 1400204429. El Shafie, Majed (2012). Freedom Fighter: One Man's Fight for One Free World. Destiny Image Publishers. ISBN 0768487730. Bibi, Asia; Tollet, Anne-Isabelle (2013). Blasphemy: A Memoir: Sentenced to Death Over a Cup of Water. Chicago Review Press. ISBN 1613748922. Shahid, Kunwar Khuldune (1 November 2018). "The release of Asia Bibi is a small step towards a more open Pakistan". The Guardian. Retrieved 1 November 2018. Aijazi, Tamjid (12 January 2019). "Asia Bibi verdict: How the entire Pakistan media was censored?". The News Tribe. Retrieved 12 January 2019. "Freedom for Asia Bibi!". AsiaBibi.org. Siddiqui, Zain (1 November 2018). "These 7 points explain the Supreme Court's decision to free Asia Bibi". Dawn. Zaimov, Stoyan (23 February 2018). "EU Warns Pakistan of Consequences If Christian Mother Asia Bibi, Sentenced to Death, Is Not Released". The Christian Post. "Islamic Law, the Nation State, and the Case of Pakistan". "The Untold Truth of Pakistan's Blasphemy Law". Wikimedia Commons has media related to Asia Bibi.